When Google first announced its Chrome OS project, many commentators assumed that the Internet giant was challenging the dominance of Microsoft Windows. The truth is, Chrome is not a threat to Windows, OS X, or any distribution of Linux--nor is it meant to be. At Google's unveiling of Chome earlier this month, Sundar Pichai, VP of Product Managment, stated "a lot of what you see on Chrome OS will make its way to Chrome." Since Pichai also mentioned that, internally, Google staffers joke that “Chome is Chrome OS,” it makes sense that most features will be replicated on both products. Like many others here at PC World, I recently downloaded an early version of the Chromium OS built in a virtual machine. 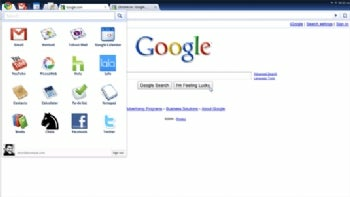 I didn’t spend much time using it, because not only was it slow and buggy (as is to be expected at this stage of development), but because aside from additions like the Application Panel, Application Tabs, and Notification Panels, there's not much in the OS that the Chrome browser doesn’t already have. Chrome is Chrome. By completely omitting local apps and storage Google made it obvious that it’s not looking to replace your existing OS. Pichai acknowledged that not all apps will run on the Chrome OS and countered that "most people who buy this device next year...expect them to have another machine at home." As my colleague Robert Strohmeyer pointed out last week, Chrome OS seems intentionally unremarkable. This demonstrates that Google isn’t positioning Chrome to take over as your media center, gaming machine, or professional workstation. Chrome OS is being developed to fill a need for fast, dirt-cheap, Web-centric computers that are highly mobile and have extended battery life. Beyond that, the Chrome initiative exists to promote next-generation HTML5 Web apps and to create a computing ecosystem that replicates Chrome's features and settings across multiple platforms. Chrome exists as a catalyst to accelerate the development of Web-centric applications, and to give people more reason to start using Web-based alternatives to traditional apps. Because Chrome OS is open source, Google can’t sell it and isn’t financially motivated to replace your desktop OS. Google will be just as happy to have you running the Chrome browser on your existing computer as to have you buy a netbook equipped with Chrome OS. However, as Google’s primary source of income is advertising, it wants people on the Web as much as possible. By supplying a high-performance Web browser that works across all popular OSs and can even serve as its own OS on mobile devices, Google is hoping to drive users to the Web services that boost its bottom line.